There's like 50 of these signs heading south. Last edited by Tuscon William; 05-06-2014 at 01:23 PM.. When in Rome..... He violated Mexican law in Mexico. He now suffers the consequences. I travel to Thailand every year. They have some laws that we don't. For example: If you bad mouth the King you can end up in hack. Even if I did have an issue with the man I would keep it to myself. Respect and obey the laws of the country you are in. In Thailand you are not allowed to bring firearms into the country. Do so and enjoy a stay in the Bangkok Hilton. Unlike our prisons Thai prisons are meant to punish. No thank you. I'll obey the law of the land. It is a shame that unlike Mexico our elected reps are unwilling to enforce our laws, or at the very least are very selective about it. 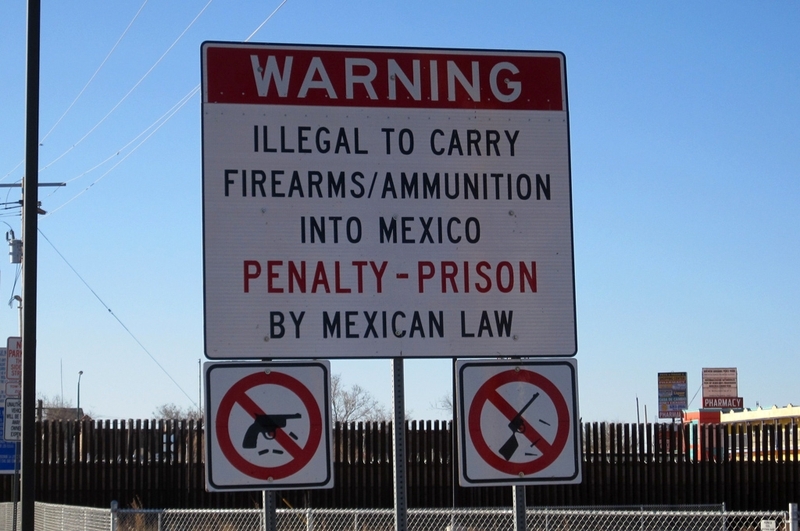 That said I am pretty sure that if an illegal from Mexico is caught with a gun here they will be answering some hard questions. If it's like El Paso, it would be extremely easy. If you happen to be in the wrong lane or don't exit in time, you're suddenly iin Mexico. People don't realize how very open the border is. You can be driving along, miss the exit and be in that country. Agreed and ILLEGAL aliens need to follow OUR rules too which means STAY OUT of the US. Yea I got censored for saying the obvious " How can we trust the 12 million Illegals to follow every laws, like speed limits? And I wonder how you figured this is an illegal immigration issue ?